Super cake day always on birthday day!!! I been baking cakes for years from my cake studio but this is the first time I take my business in to the internet for more cake lovers to see, learn, enjoy and share the goodness of baking and decorating. 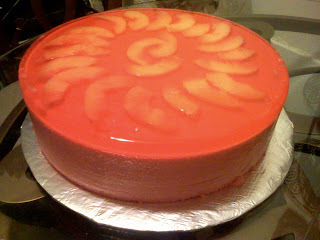 So, I made this Jello Cake! Is the best for the season. It has butter cake in the middle, creamy strawberry jello outside and is top with strawberry jello and sliced peaches... yum yum .... just what everybody love ! But don't feel bad, you can also get this delicious cake by giving me a call ! You can check the prices and sizes on my menu and if you have any questions don't hesitated and give me a call any time: 516-661-2865 / 917-829-6893. I'll be posting more of my passion... please enjoy and I also will try to post recipes and decorating tips for you !! !